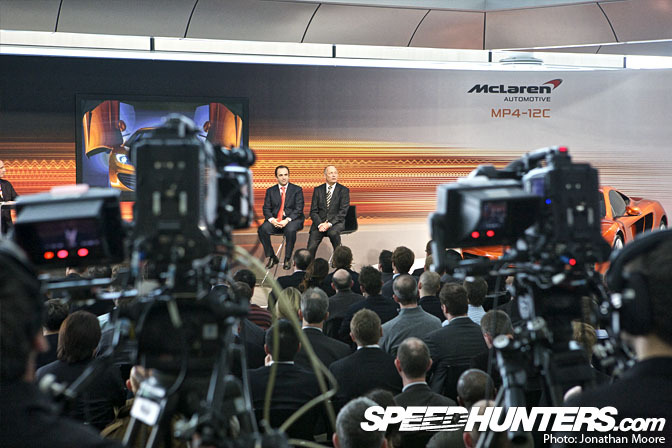 March 18 turned out to be a pivotal day for the famous McLaren team. 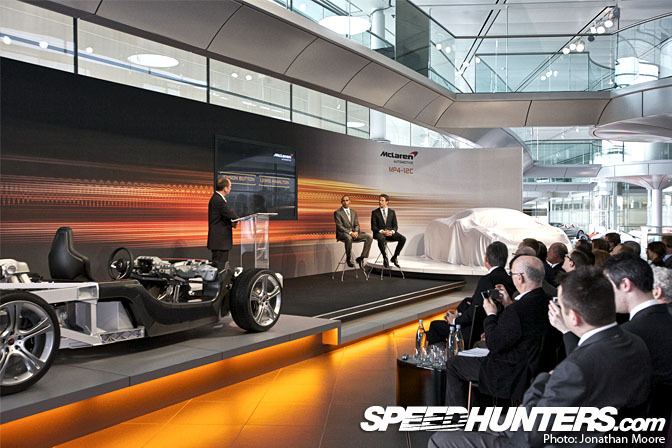 The day was marked for the launch of their new supercar, the McLaren MP4-12C – announced as a concept last year and now about to be unveiled for the first time in public at the architecturally stunning McLaren Technology Centre in Woking, Surrey. But amazing as the car is in its own right, it also marked a huge shift for the team as they announced they were entering the shark-infested waters of becoming a car manufacturer. 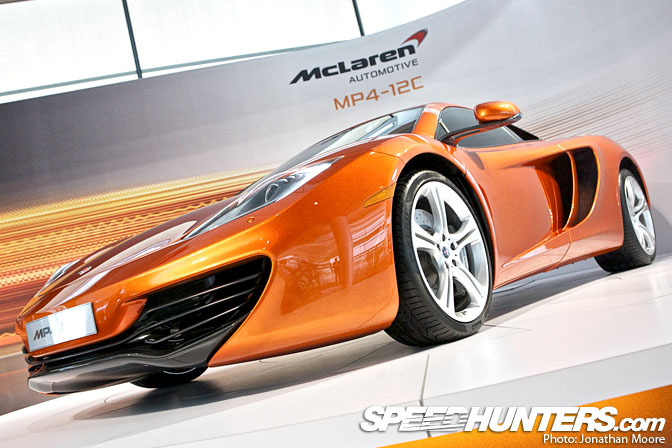 The MP4-12C is going to be the first in a line of McLaren street cars. Well, of course, there are street cars and street cars. McLaren are famous for the F1 sportscar from the mid-90s, a barely disguised Le Mans weapon that only the very fortunate few ever got to drive on the road. 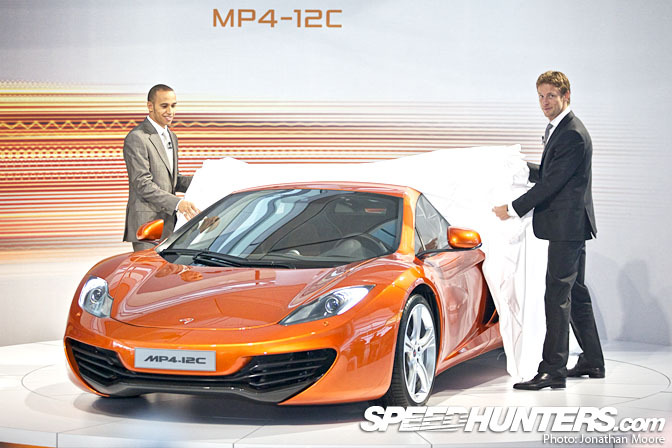 The MP4-12C launch during the day was followed up with even bigger breaking news: the team have bought back the majority of the shares previously owned by Mercedes-Benz. 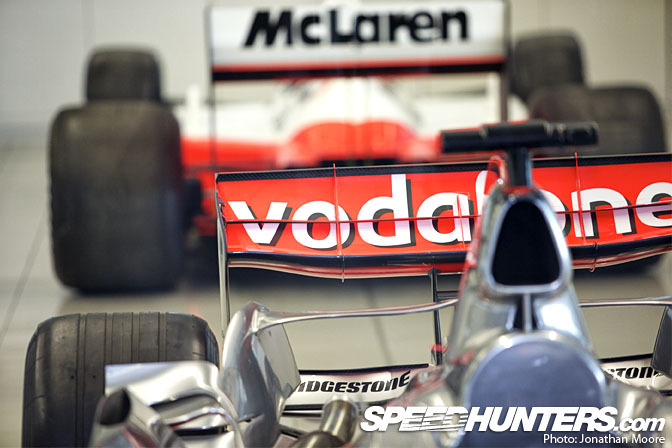 McLaren are aggressively stating their intent to become a car company in their own right, and the down-grading of factory support from Merc in F1 was perhaps a pretty obvious sign that the long and successful partnership was drawing to a natural close. 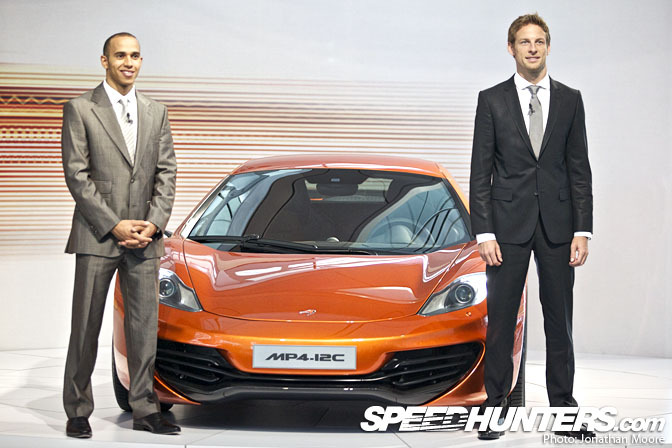 When you're McLaren, you can also count on some pretty high profile guests to introduce your new car. 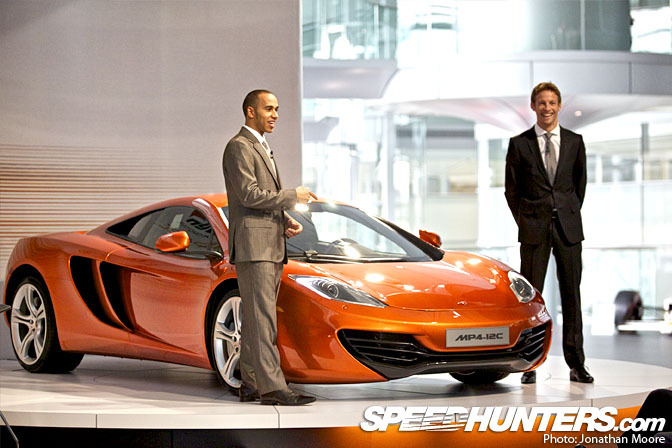 Lewis Hamilton was another person in awe of the F1: as part of his rider he got to 'borrow' a McLaren factory car as a reward for winning the World Championship. He had to give it back, poor guy. 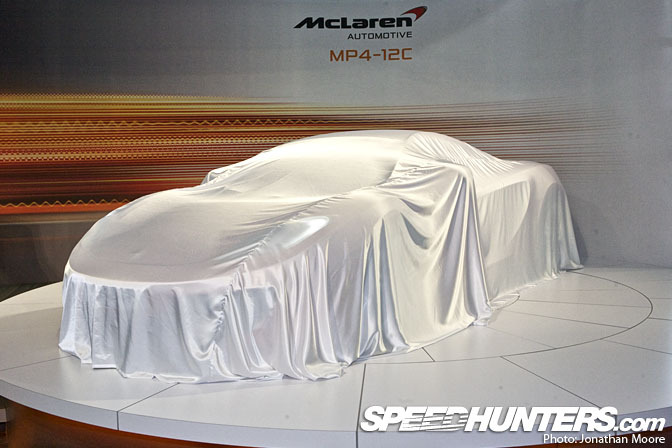 As the world's media gathered, the pre-production MP4-12C sat under its translucent white sheet, headlights glowing. The presentation was held in the middle of the… factory? Office? Museum? The Foster-designed building is all these things. 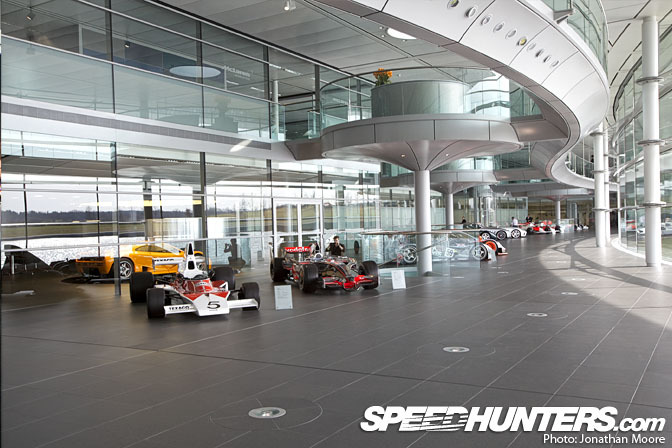 Translucent glass walls are everywhere, allowing you to see the surrounding McLaren staff going about their business on the floors above and the bays behind and below. To stage left stretched the mind-blowing collection of McLaren cars: I'll put the spotlight on them in a follow-up story. 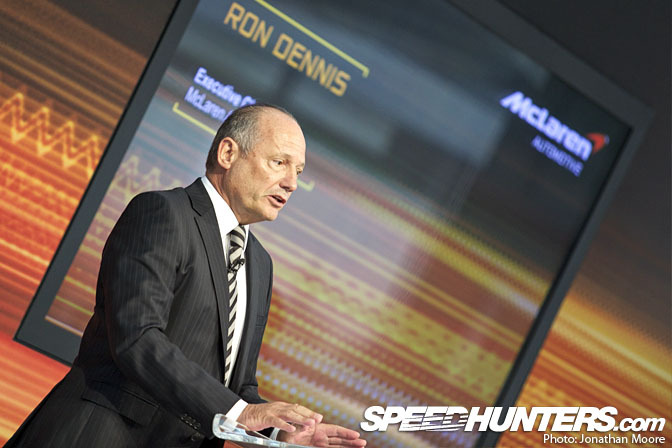 Antony Sheriff, McLaren Managing Director, kicked off proceedings with an introduction about the company and its evolution over the past decades. 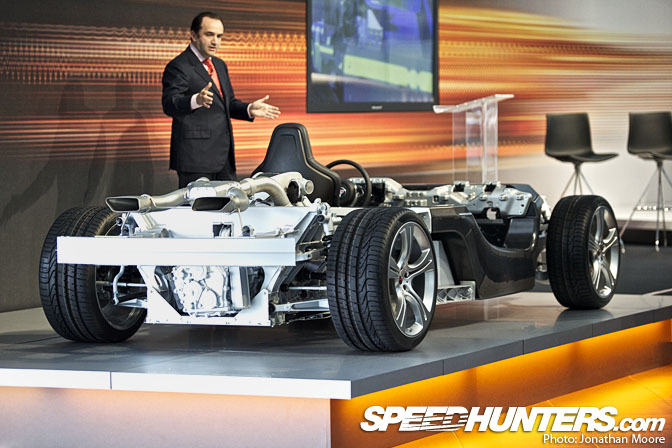 His prop was a complete rolling chassis: this is what's under the skin of an MP4-12C: it's T2000 with the skin off. The driver sits in a carbon tub, with an aluminium crash structure on the front and the twin-turbo 3.8-litre V8 engine and up-and-over exhausts out back. 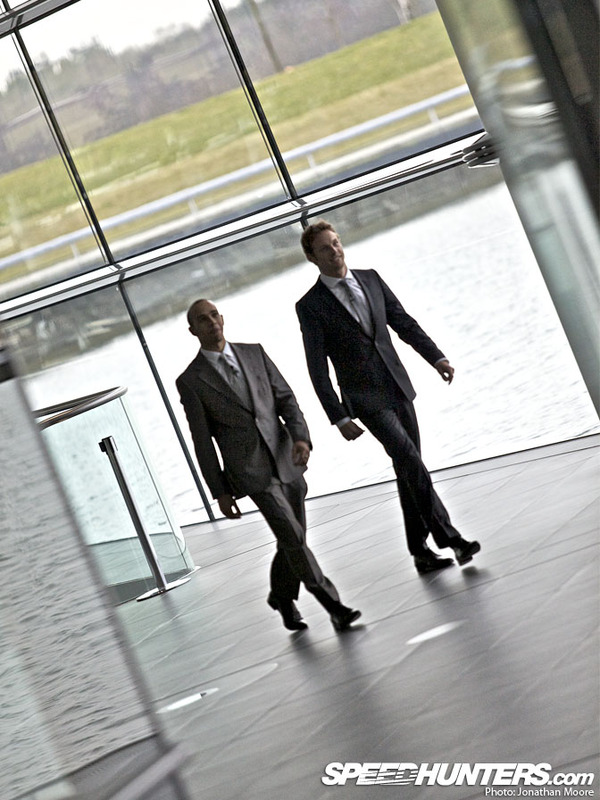 McLaren boss Ron Dennis backed up F1 team manager Martin Whitmarsh, outlining an aggressive strategy for the company. They already have 1,600 likely purchases for a car they can't – and won't – build more than a thousand at most of each year, and where the first production model won't roll off the line until Spring of 2011. Prices haven't been confirmed, but seem likely to be between £125,000 and £175,000. Time to start saving pocket-money. That's a lot of odd jobs. 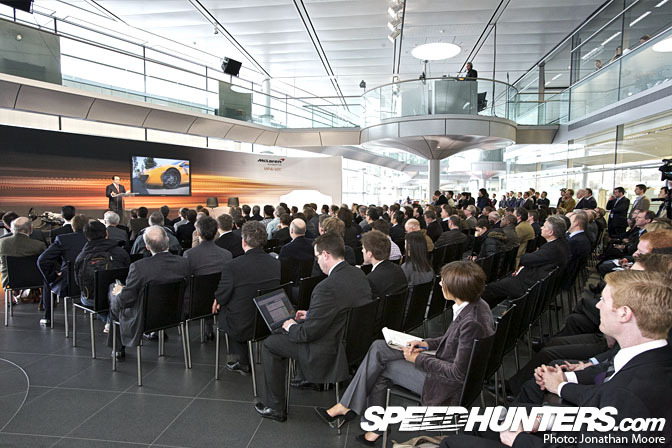 All the way through the presentation, Dennis reinforced the Formula One DNA running through the MP4-12C. This was pretty easy to take on board with the full Formula One team area just to our left. McLaren take their history seriously. The swoop of cars along the water front of the building isn't just for show: even in the F1 prep bays a classic Marlboro-liveried car sat back-to-back with last year's F1 car, as they're all kept in perfect running order. 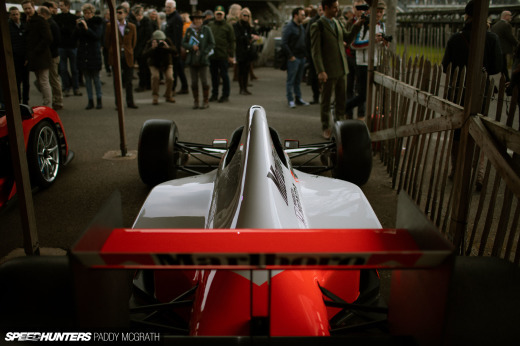 The film that Rod posted up earlier was next up: 2009 F1 World Champion Jenson Button and 2008 World Champion Lewis Hamilton paired up in MP4-12Cs and blasting round the classic Goodwood track. Although some promotional events probably are a bit tedious, it seemed that the two of them had no problems what so ever firing their new mounts round the track. It might be loaded with electronics, but you can apparently still powerslide the thing with ease. 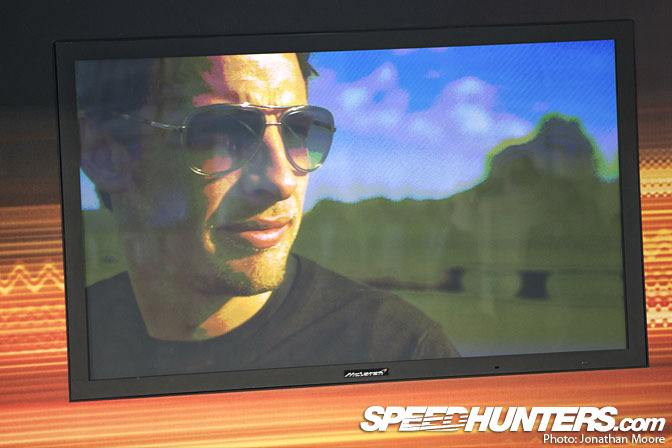 Unfortunately Jenson must have left his Aviators at Goodwood, so no chance to score a pair for Rod. Movie over, the two of them strolled out, taking their on-track battle to the tailors by the look of the sharp suits. It was funny to see the pair of them talking together: not best buddies quite obviously, but they seem to genuinely get on okay. 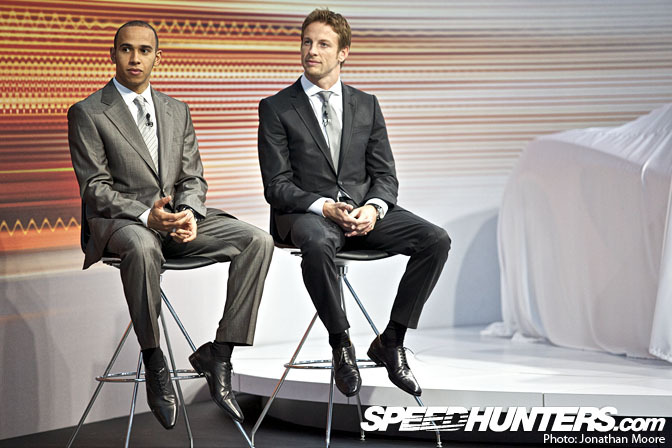 However, it was funny that Lewis would often remark about how long he's been at McLaren. Trying to undermine new boy Button a bit maybe?! 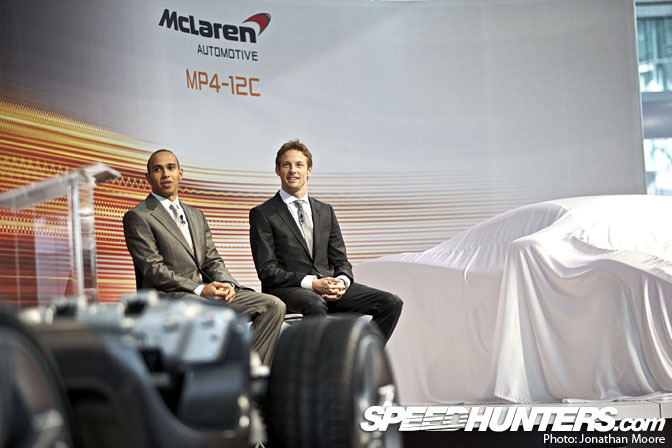 Finally it was show-time: time for the unveiling, with Hamilton and Button doing the honours. 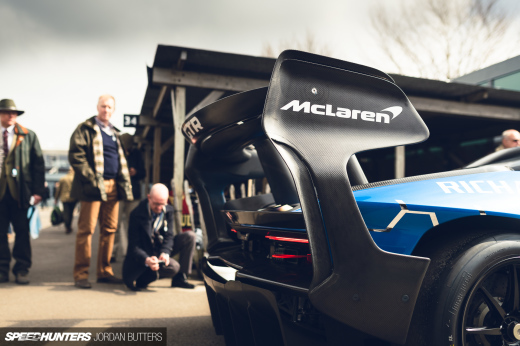 With the carbon tub being the core of the car, McLaren were able to sculpt the body exactly as they wanted. It has more than a passing similarity to its '90s F1 cousin, but that's neither a surprise nor a bad thing in my opinion! 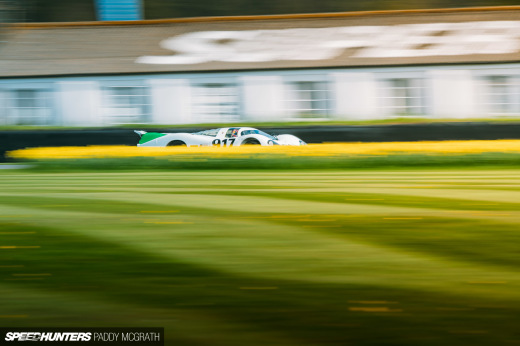 A final Q&A session wrapped things up, before those attendees lucky (that's not the word I actually want to use) enough to have the invitation were shepherded off to waiting mini-vans for the trip down to Goodwood and a look at the car in action. Button would be straight off to McLaren's cutting-edge race simulator as soon as the session finished; both drivers are flying out to Australia this weekend in preparation for the second Grand Prix of the season. The entire event was broadcast live on the internet, and also attracted the full gamut of international media. 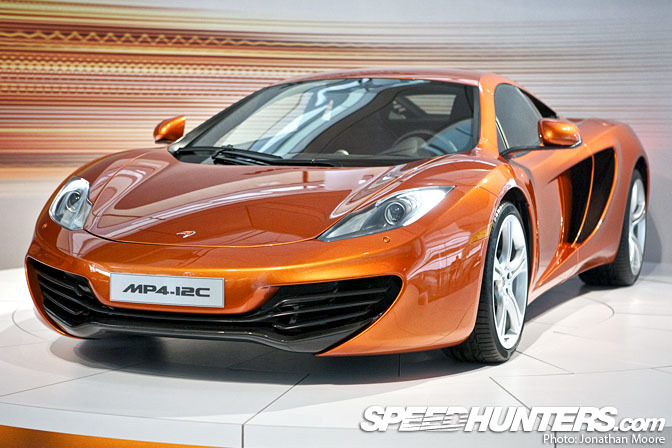 Admittedly the MP4-12C doesn't have a particularly romantic name for a high-end car: a typically McLaren functional model number is all it gets, but that doesn't mean it struggles in matching its Italian rivals' aesthetics. Or the supercar performance. 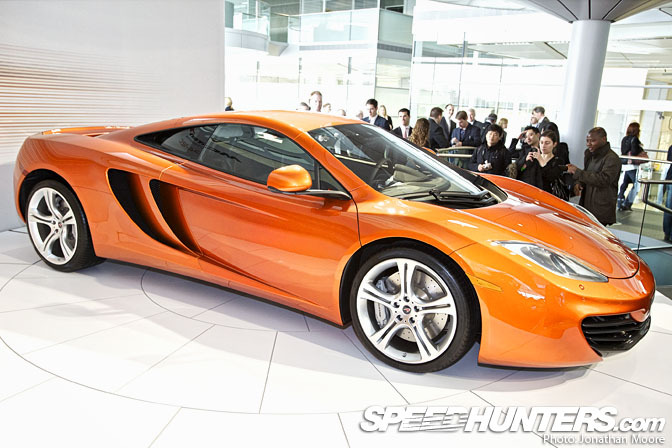 Just over 100 McLaren F1s were built in the 90s, whereas the MP4-12C is expected to be made in the thousands. It's an incredibly audacious plan: and a mouth-watering prospect to be able to see these gliding around. 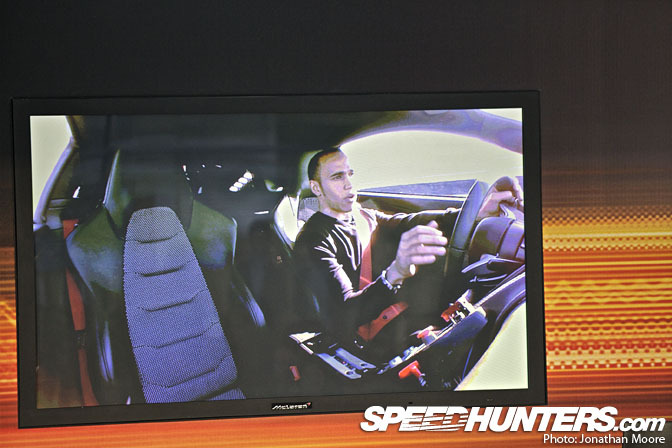 It's crammed full of technology, but at the end of the day McLaren really just care if it drives well. 40-odd mules have been tested everywhere from the Midlands in England to the Nurburgring via the Middle Eastern desert and Scandinavian snowy wastes. As with the F1 sportscar, for all the supercar specs it's a car that is supposed to be practical. Drive it to the shops. Give the kid (singular) a lift to school. That kind of thing. And the best thing? 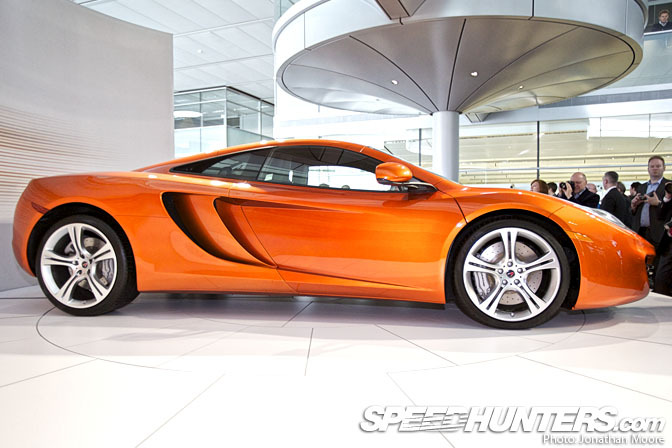 The MP4-12C is just first of many things that was ripe for Speedhunting at the MTC. 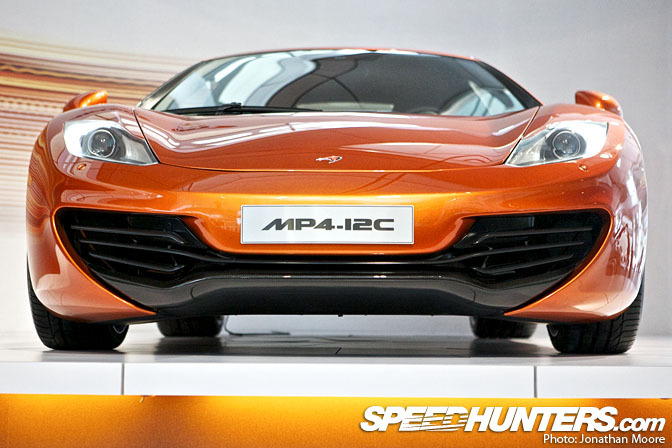 Watch out for follow-up stories on the MP4-12C prototype production line and a spotlight on the incredible line-up of historic McLarens coming up soon! Quoting the above "guestimated" price of "£125,000 and £175,000", (with or without VAT unknown), which converts to roughly $266,865. $266,865 VS $375,000 = LOLOLOLOLOLOLOLZ @ Toyota. not the best looking thing but pretty fast I'm sure. This stirs almost no emotion inside me. It probably is pretty fun to drive though. Requesting top picture as a wallpaper gentlemen, thank you. This new Mclaren looks pretty bland. Looks like its from 1995!! you should have sent Andy Blackmore to this. Being ex-McLaren, I'm sure he would have got even more insight. 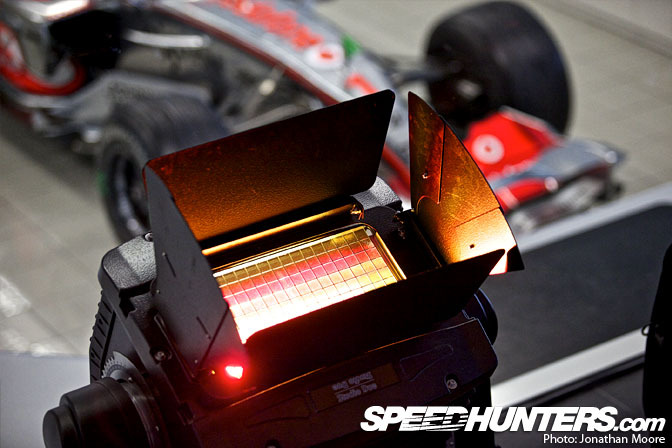 Great piece, a real highlight of Speedhunters recently. Top Job! End of story. The McLaren F1 has always been my favorite supercar, and I think this is a worthy addition to the breed. I've heard tell they are planning on making an even faster car as well? mike - not fair! Long time since I was at McLaren and times change. Jonathan wrote a great article, capturing the event better than anywhere else I've seen on the net and much better than my writing! Mclaren has another street car dropping. What about that? I don't doubt it's fast.....but I'm not feeling it. It's missing something....some personality.....it looks very tame (and maybe I'm wrong). Like said early, it looks like a big Lotus Evora.....I'll pass. Its nice, if a little understated compared to the orig F1, but i think that is the idea. @ lil timmy: Classic speedhunters response lol! Ahem... T-800 with its skin off... the T-1000 had no skin, .. the T-1000 and T-X didnt have skin. this is the best they could come up with? sort of disappointing.